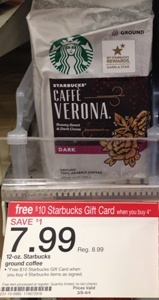 The Starbucks offer at Target just got even better. Through 4/11, you can score a $5 Starbucks gift card when you submit a rebate form, stack this on top of the $10 Starbucks gift card and you’ve got yourself one sweet deal! My Target (VA) was having some sort of problem with the Starbucks gift cards so I got a $10 Target gift card instead. Thank you for sharing this!!! I ran out of Starbucks this weekend, so it was perfect timing. I even had a couple Target coupons for Starbucks that I was able to use too! Crazy good deal!